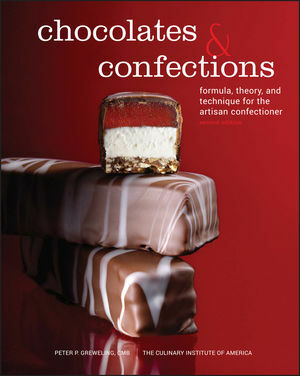 Chocolates & Confections, 2e offers a complete and thorough explanation of the ingredients, theories, techniques, and formulas needed to create every kind of chocolate and confection. It is beautifully illustrated with 250 full-color photographs of ingredients, step-by-step techniques, and finished chocolates and confections. From truffles, hard candies, brittles, toffee, caramels, and taffy to butter ganache confections, fondants, fudges, gummies, candied fruit, marshmallows, divinity, nougat, marzipan, gianduja, and rochers, Chocolates & Confections 2e offers the tools and techniques for professional mastery. Peter P. Greweling is a professor of baking and pastry arts at The Culinary Institute of America and is a Certified Master Baker (CMB) and Certified Hospitality Educator (CHE). Prior to his 20-plus-year teaching career, Chef Greweling worked as a pastry chef at numerous restaurants and hotels in the New York City metropolitan area. A graduate of the New England Culinary Institute, he has further education in confectionery technology from the RCA, IFT, RCI, and Richardson Researches. Chef Greweling has published articles in Manufacturing Confectioner magazine, presented numerous times at the Philadelphia Candy Show, and is the author of Chocolates and Confections at Home with the Culinary Institute of Americaca. Founded in 1946, The Culinary Institute of America is an independent, not-for-profit college offering bachelor's and associate degrees in culinary arts and baking and pastry arts, as well as certificate programs in Latin cuisines and wine and beverage studies. A network of more than 44,000 alumni has helped the CIA earn its reputation as the world's premier culinary college. The CIA, which also offers courses for professionals and food enthusiasts, as well as consulting services for the foodservice and hospitality industry, has campuses in Hyde Park, New York; St. Helena, California; San Antonio, Texas; and Singapore.